Repeat R2 and R3 for the desired length. I crocheted until I used the full 2 balls of Yarn (approximately 65″ in length). Do you want to make this piece wider? Hi Rhondda thanks for lovely pattern just wondering mine is looking like it is getting wider as it grows, I have same number of stitches etc do you think this will block out? Also do you just fasten off at end of row 3 or is there a row to finish with? If you have finished Row 1 you will have chains of 5 stitches with single crochet stitches between. When you end Row 1 you turn, ch 5, then the picot you will work is into the 3rd ch in the first set of 5 chain stitches. Then you chain 5 again and work your next picot stitch into the 3rd ch of the next set of 5 chain stitches. You repeat this all the way across your project. Can’t figure out what I am doing wrong. Can’t figure out how to end round and begin row 2-3. 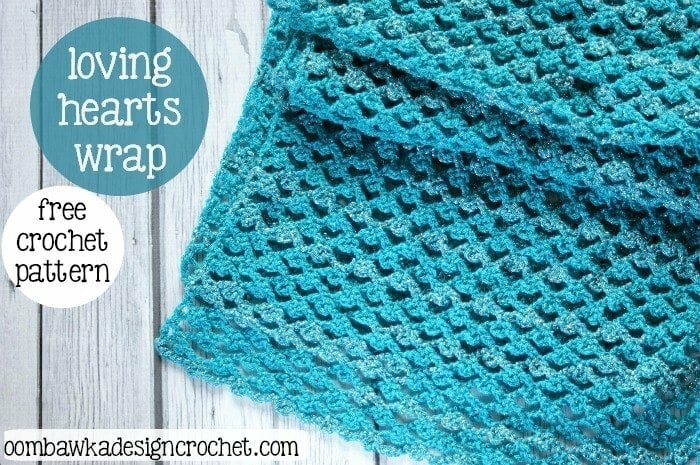 Love how this looks and really want to make a scarf but am truly frustrated and lost.help please. 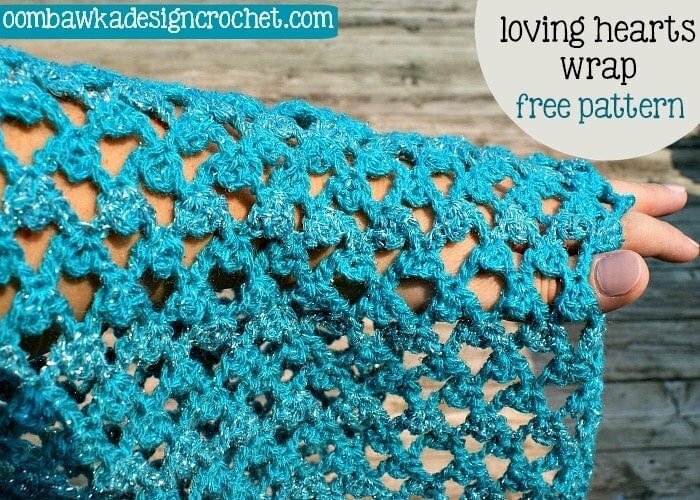 This is a really pretty wrap, love the pattern. How nice of you to share it for free! Thank you for your creativity and hard work!! I would love to know how to make this into a long skirt. Could you help me? Can’t wait to start this pattern! Thank you for sharing it. It’s beautiful! 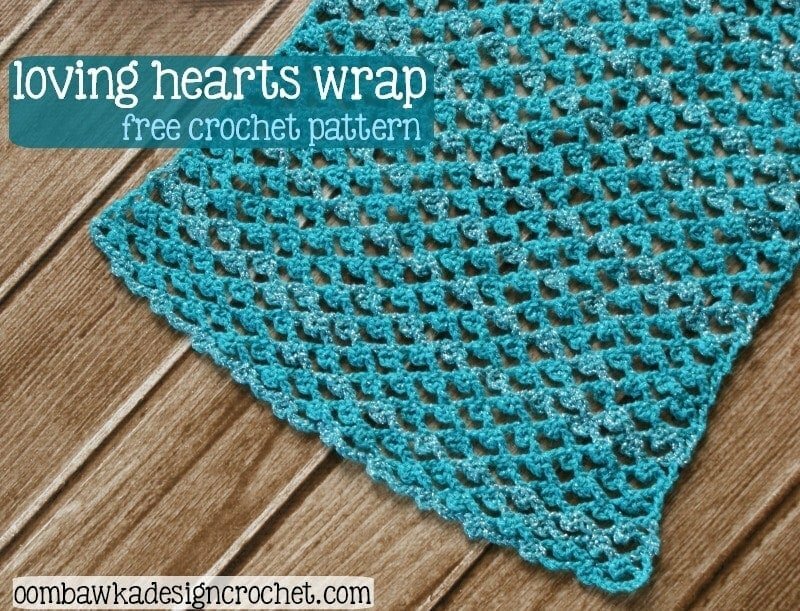 You have many lovely patterns, but I think this one (Loving Hearts Wrap) is my favorite. It would make lovely prayer shawls. hope u will add video for ur next works….keep going on with ur paterns…. I’d love the tutorial too . I work better with visuals. I like this one – thank you for sharing. Thank you Angelica 🙂 The handbags sound like a lovely idea! Have fun! Love the wrap, very chic! Hi Madeline, Thank you 🙂 I used 2 balls of Patons Glam Stripes – each ball has 261 yards (239 m) – so you need 2 to make one the same size as the one I made. What is the yardage of the yarn you used? This is a lovely pattern! Thanks for sharing it for free! Hi Sharon 🙂 Thank you!! 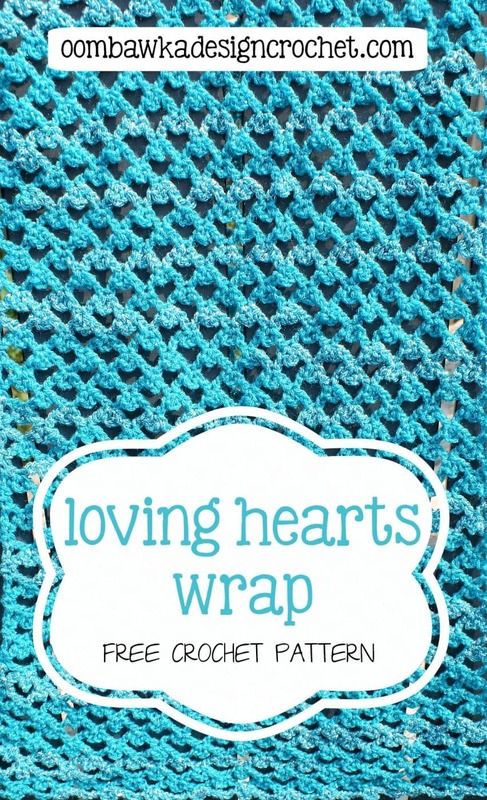 The yarn was neat to work with too – I loved the sections where the silver striped through it – and you are most welcome for the patterns and help!! I love this wrap and definitely my color! Thank you so much for all your fabulous patterns and help! love this wrap, what was the yarn you used too make this?